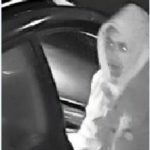 Saanich Police would like help in identifying the male in the picture. He was captured on CCTV breaking into a vehicle parked in the Wicklow street area. He stole some Rayban sunglasses. He was wearing a white hoody under a jacket and skinny jeans. He had converse type shoes on. He is white and in his early 20’s. If you know who he is and wish to remain anonymous, call Crime Stoppers at 1-800-222-8477. If your information leads to an arrest or recovery of property, you could earn a reward.